HAPPY NEW YEAR ALL!!! So, i am a day late, lol, but better late than never right?!?!? I hope you all had a safe and happy New Year! Our little family just stayed home, had munchies, played board games and had a quite little evening. To me it was the perfect New Year. All accept for the fact that i fell asleep 40 minutes before the ball dropped and then when my hubby tried to get me up i was so groggy i was just like "yeah.... Happy (yawn) New Year (continue snoring)". Oh well... what can you do?!?!? So, today's card is a "manly" birthday card since tomorrow is my hubby's birthday (did I mention that today was my birthday?!?!?). This card is super simple and I only used 7 total products to assemble it! The card measures at average size of 4 1/4" x 5 1/2". 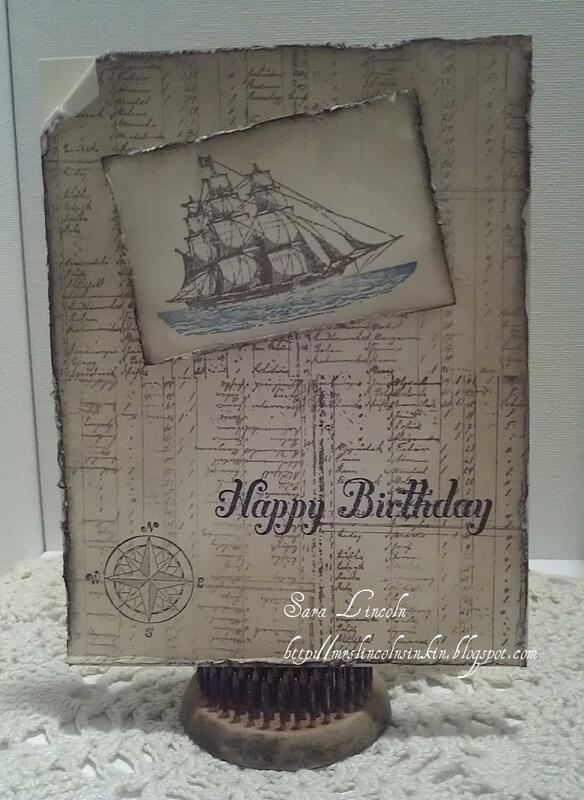 I took the "ledger" stamp from the Open Sea set and stamped it 4 times to make my background. I then sponged the edges and then took my distressing tool to make them looked aged. 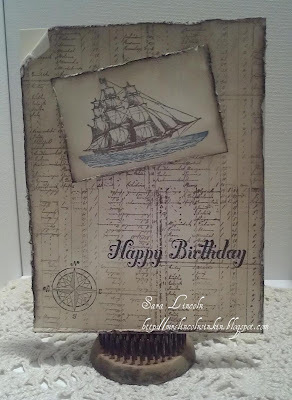 Stamped my boat, and greeting... added another little stamp from the same set for decoration and that's it! I love the way the edges turned out!! Don't forget all... that today is the last day that you can order from the Holiday Catalog! There are so many things in there that would make a great addition to your collection. Don't miss out, click HERE to check out the catalog! !